Custom base plates are designed to help you safely tow your vehicle. Removable draw bars and different attachement methods will allow you to choose the system that best fits your towing needs. OR FLIP THE PAGES TO FIND IT. Failure to comply with your towed vehicle's owner's manual could result in property damage or personal injury. Many Blue Ox Baseplates are designed to use existing holes and hardware to mount the baseplate to the towed vehicle. Even though bolts are there, do not assume they are adequate for baseplate mounting. 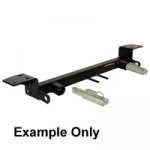 Always use hardware supplied in the hardware kit or existing hardware specified in the Baseplate Towing Installation Instructions. Please note that baseplate height measurements are approximate and may vary slightly depending on the size and type of tire installed on the vehicle.